There’s a metric s**t-ton of locations throughout the greater Los Angeles area where you can take your Christmas tree for recycling, rather than doing what I’ve done in years past & leaving it up ’til March (classy, I know). Or you can DIY it and chop that sucker up yourself; you can then put your hacked-to-pieces Christmas tree into your green recycling bin. Those who don’t have the means to do so can drop their tree off at any one of the locations here. And the Dept of Public Works has more info here too. 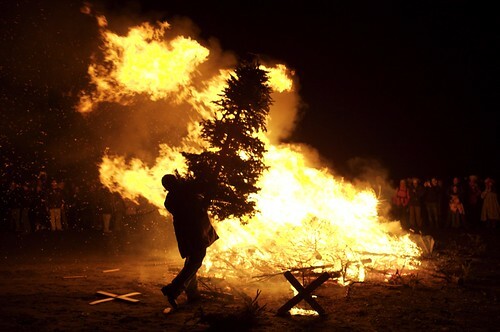 Xmas tree burn photo by the illustrious and awesome Laughing Squid. My tiny tree just gets bagged and put in the garage for future use! Previous PostPrevious Merry Chrismakwanznukah to all, and to all a good night!